As with all racing safety equipment, racing seat fitment is critically important, and the racing seat user can increase the risk of injury if they are not fitted properly. A racing seat is an extremely important safety item regardless if you are racing circle track, road racing, drag racing, drifting or participating in any other type of motorsports event. The racing seat must support the driver’s full body and permit sitting within the vehicle’s confined space with as little fatigue as possible. There are several high-quality racing seat manufacturers, one of them being the Ultra Shield™ Race Products brand. Please refer to the general racing seat sizing chart below as a starting point for choosing a racing seat. This general sizing chart can be applied to both ADULT and YOUTH racing seats, depending on the motorsports racing class. If you need a racing seat configuration outside of the chart range, please contact our Technical Sales staff for other options that may be available. Properly Measuring Fitment for a Ultra Shield™ Race Products Seat. The GENERAL RULE when sizing a racing seat is to MEASURE YOUR HIPS while in an upright natural position while sitting on a HARD surface with legs slightly apart. The person being measured ca n wear normal street clothes during this process, as a racing suit will just add to the snug fit needed for both driver comfort and safety. Be sure remove bulky stuff from the pockets prior to the measuring session. All measurements MUST be taken in ABSOLUTE straight lines. Please use a yard stick or ideally, a tire stagger gauge. 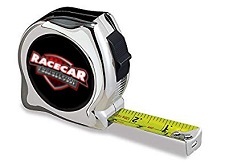 If you ONLY have a tape measure, DO NOT let it bend or follow the curves of the body in any way, as proper seat sizing and fitment will be compromised. Most STANDARD &apos;Off-The-Shelf&apos; racing seats will probably fit a normal size driver perfectly. 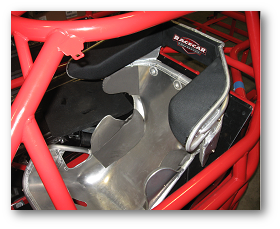 The racing seat manufacturers that Racecar Engineering™ represents have produced thousands of seats over the years and have optimized their production dimensions to fit almost every type of body. Once you have that measurement, you can then choose a seat using the chart below. Simply find the type of car or series that you race, and you will see the series styles available, along with the range of standard production seat sizes using the hip measurement. REMEMBER - Choosing a racing seat can be REALLY confusing, as it is very common for SEVERAL different types of seat styles from a manufacturer, to be available for use in one particular type of race car (i.e. : Sprint Cars, Late-Models, Drag Cars, etc.). It is up to the driver, crew chief or car owner, to sort through all of the features and benefits of each applicable seat style in order to finalize preferred seat choice. Many times, your chassis builders will have a preferred seat brand and style that they recommend for their race cars, so please check with them if they are available to consult. Finally, it you or your team cannot figure-out which racing seat would work the best for you, please contact one of our Technical Sales Associates and they will work with you (and also the factory is needed) to determine the best racing seat style for your type of racing. If you DO NOT find a basic seat size that works well, you may have to consider having a custom racing seat made by the factory. If this is the case, please refer to the CUSTOM RACING SEAT section listed below. IMPORTANT NOTE - Effective September 1, 2018 - Ultra Shield™ Race Products has CHANGED ALL SEAT PART NUMBERS and SUPERSEDED all seats to the NEW Factory Part Number Series&apos; shown below. It is IMPORTANT to understand that Racecar Engineering™ has a great deal of the previous production style seats (as do most dealers). These seats we have in stock are perfectly OK to use. This was just a slight factory design change that required the factory to use new part numbers. If you have questions about this factory change, please our Technical Sale staff for assistance. 14" - 14.5" - 15" - 15.5" - 16" - 16.5" - 17" - 17.5" - 18"
14" - 15" - 16" - 17" - 18"
11" - 12" - 13" - 14"
Jr. 11" - 14" / Adult 14"-17"
Ultra Shield™ Race Products takes pride in producing hundreds of custom seats each year and Racecar Engineering™ makes it easy to order a custom racing seat. 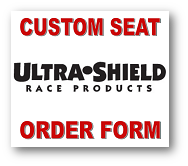 If you require a custom-made racing seat made to your specifications, get a head-start now by downloading the Ultra Shield™ Race Products Custom Racing Seat Order Form by clicking the button at the right. After you have taken your measurements, please contact our Technical Sales staff for a price quote and estimated delivery date. Please remember that Racecar Engineering™ carries a full assortment of all Ultra Shield™ Race Products seat products and also the additional quality parts that Ultra Shield™ Race Products offers like helmet visor tears-offs, neck support collars and more. 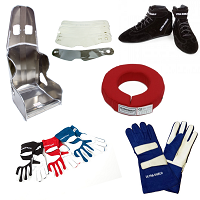 On top of that, we also have in stock and ready to ship, a full selection of name brand racing suits, driving gloves and shoes, underwear, hoods, socks, helmets, harness pads, seat belt restraints, helmet skirts, gear storage bags and much more. *** RACING SEAT SIZING/FITMENT CHART DISCLAIMER: This racing seat sizing/fitment chart has been created by Racecar Engineering™ for our customer&apos;s reference and ease-of-use using the latest fitment information available from the factory. Please always refer to the factory website, factory printed materials and factory personnel advice for the latest racing seat information about their brand of safety product. The Ultra Shield™ Race Products factory website can be accessed directly at www.ultrashieldrace.com. (link opens new page) - Racecar Engineering™ is not responsible for any typographical errors contained in this racing seat sizing chart/fitment material or the end-user&apos;s failure to verify & follow factory fitment specifications. SEATING PRODUCTS - USAGE DISCLAIMER - No seat or any type of seat related product sold by Racecar Engineering™ should ever be used on a street car, street truck or any type of street vehicle at any time, UNLESS the manufacturer can provide the user proof (a written legal document) that states that their seat product(s) conform to the National Highway Traffic Safety Administration (NHTSA) National Traffic and Motor Vehicle Safety Act of 1966, as amended, 49 U.S.C. chapter 301 (the Vehicle Safety Act), and abide by certain other applicable laws relating to motor vehicle safety. All companies that manufacturer, produce and import these types of products must ensure that their products comply with all applicable Federal Motor Vehicle Safety Standards (FMVSS). It is the SOLE responsibility of the end-user to ensure any product that they are intending to use is fit, and legal, for their intended automotive purposes. Racecar Engineering™ will NOT be responsible, or liable, in any way due to the misuse of any type of seating product sold through Racecar Engineering™ that results in an accident, injury, death or any type of related consequential damages.